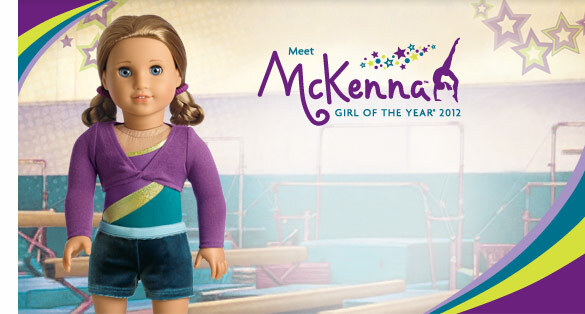 ChiIL Mama : Welcome McKenna, the Gymnast & Newest American Girl Doll! 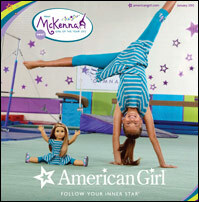 Welcome McKenna, the Gymnast & Newest American Girl Doll! • January 2: 11:00 a.m. – 1:00 p.m. Your girl will flip for our newest Girl of the Year! At this special event, she can be among the first to learn about this new character’s world. Join us for demonstrations, crafts, free giveaways, and more. Start your new year with a new friend! 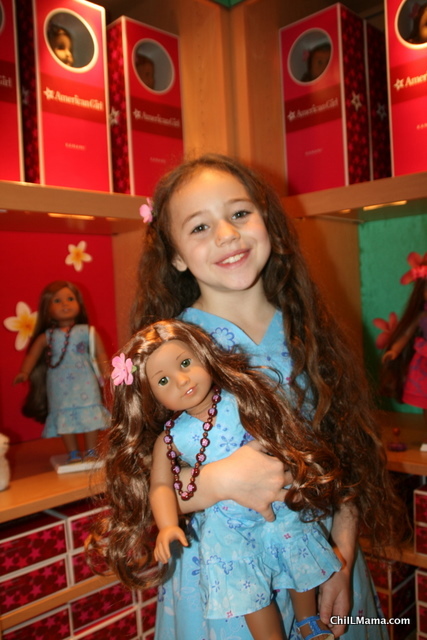 Here at ChiIL Mama we were elated to be able to review and give away a Kanani Doll in 2011. She turned out to be THE most popular American Girl Doll of The Year ever! We'll still be celebrating Kanani as one of our top toys of 2011 this week, with a giant, photo filled feature on Kanani visits Chicago. Kanani and ChiIL Mama's own Sage Ani prove that American girls aren't all that different even when they live half way around the world from each other! We took Kanani on the el train and to Chicago favorites. Then we explored the impressive world of American Girl Dolls downtown at Water Tower Place. As the friend of a real 8 year old gymnast, our Kanani has been to a number of meets. 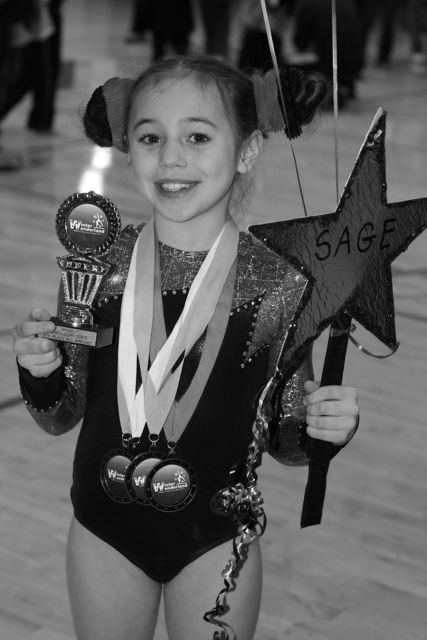 My daughter placed first in state in 2010 and made it to state again in December 2011 in a harder, higher level, beating her own best scores in bars, beam, floor and vault. 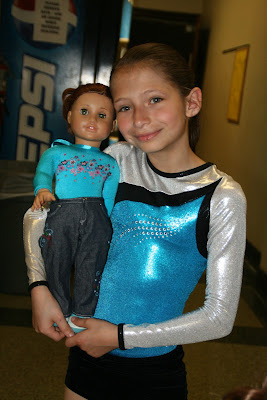 In fact, she first got Kanani after a gymnastics show! 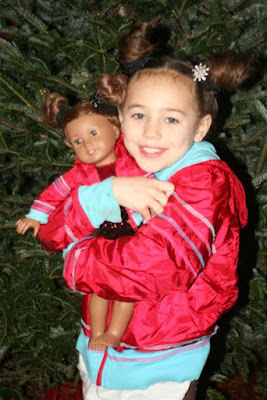 Real life American girl gymnast, Sage, who will be entering 4th grade this year, just like McKenna, with Kanani, American Girl Doll of The Year 2010! As much as we love our Hawaiian girl from Kauai, she'll have some stiff competition, as little girls all over the world tumble for McKenna, the gymnast, this year. 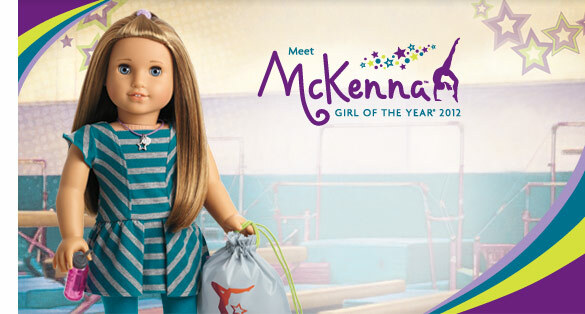 We're hoping to be able to offer a McKenna doll to one of our lucky readers to kick off 2012 and will keep everyone posted. *American Girl’s Girl of the Year debut in Chicago — free and open to the public — January 1 and 2. Bring your daughter down to Water Tower Place today or tomorrow and she’ll be first to meet McKenna through free demonstrations, crafts, giveaways, and more. What: A meal and activities for getting to know the ins and outs of McKenna’s world. Why: Attendees take home an American Girl book. When: Reserve now for Jan. 13, 16 or 28, Feb. 11 or 20, or Mar. 3 or 27. What: Quick challenges are scattered throughout the store. Why: A free American Girl poster upon completion. When: Jan. 4, 6, 11, 18, 25 & 25; Feb. 1, 8, 15, 22 & 29; Mar. 7, 14, 21 & 28. What: A session to get artsy with inspiration from McKenna’s stories. Why: Bond with other American Girl fans and emerge with beautiful work to show for it. When: Jan. 7, 13, 14, 16, 21 & 28; Feb. 11 & 20; Mar. 3 & 27. What: Get to know Mary Casanova, the award-winning writer of the 2012 Girl of the Year books. Why: Ask questions, show admiration, and get a signature. From January 1, get the McKenna doll and paperback ($105) in-store at Water Tower Place, 835 North Michigan Avenue or online at americangirl.com. Call 877-247-5223 to learn more.